In this paper, we present a visionary concept referred to as Collaborative and Cognitive Network Platforms (CCNPs) as a future-proof solution for creating a dependable, self-organizing and self-managing communication substrate for effective ICT solutions to societal problems. CCNP creates a cooperative communication platform to support critical services across a range of business sectors. CCNP is based on the personal network (PN) technology which is an inherently cooperative environment prototyped in the Dutch Freeband PNP2008 and the European Union IST MAGNET projects. In CCNP, the cognitive control plane strives to exploit the resources to better satisfy the requirements of networked applications. CCNP facilitates collaboration inherently. Through cognition in the cognitive control plane, CCNP becomes a self-managed substrate. The self-managed substrate, in this paper, is defined as cognitive and collaborative middleware on which future applications run without user intervention. Endemic sensor networks may be incorporated into the CCNP concept to feed its cognitive control plane. In this paper, we present the CCNP concept and discuss the research challenges related to collaboration and cognition. Parts of this work are presented in GLOBECOM, 2009 and 21st WWRF Meeting, 2008. This work is supported by the Trans Sector Research Academy for Complex Networks and Services, Delft University of Technology, the Netherlands. IETF, Problem statement for cross-layer optimization. Internet Draft, Status: Informational, Expires: January 2011, July 12, 2010. [Online]. Available: http://tools.ietf.org/html/draft-lee-cross-layer-optimization-problem-01. Zhou, J., Jacobsson, M., Onur, E., & Niemegeers, I. (2010). 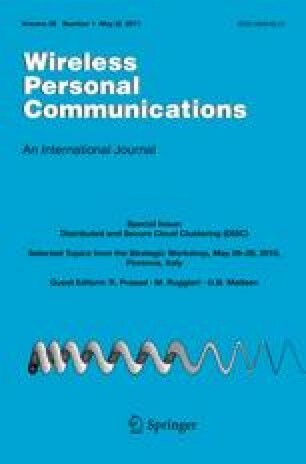 An investigation of link quality assessment for mobile multi-hop and multi-rate wireless networks. Wireless Personal Communication. doi: 10.1007/s11277-011-0263-1.